I joined a stamping group on Facebook and thought it would be fun participate in the Sunday Stamping challenge there. Today the challenge is green, so guess what... a green manicure it is. I started out with two coats of Ulta's Green with Envy and stamped with LA Colors Current. I'm pretty sure that I broke every stamping rule in the book with this, but that's just the rebel that I am. Not only did I stamp with a lighter color, but I also stamped a shimmer over a shimmer. Good thing there is no such thing as the stamping police :). 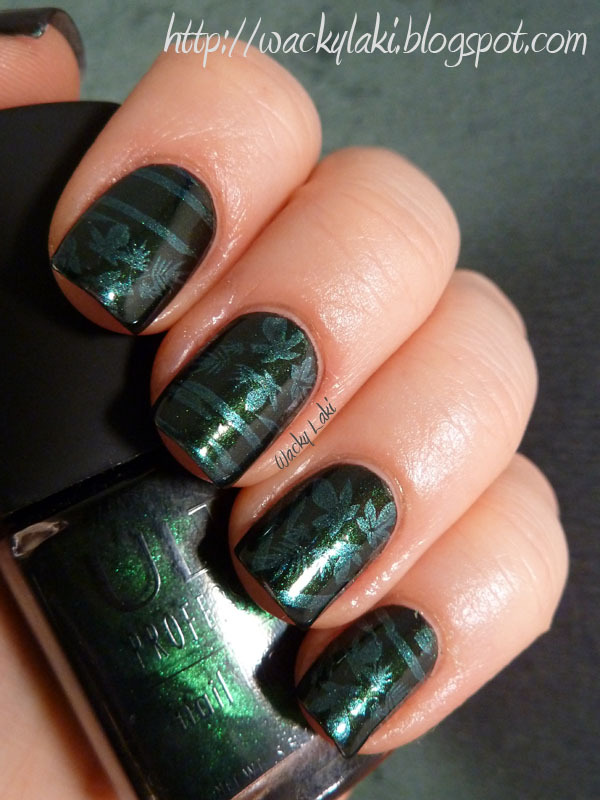 I really like the subtle stamping effect of this combination. For the stamping I used the Red Angel stamp RA-104. You might remember that I had trouble using the RA plates and even thought that mine were defective and warped. Thanks to everyone's comments and support on this issue, I believe that most people have slightly warped plates and it should not interfere with the stamping quality. So, I took a deep breath, watched a quick video on getting a good image (shared by Carolina on Facebook), and tried again. Luckily something clicked for me and the image transferred perfectly. I'm so excited! 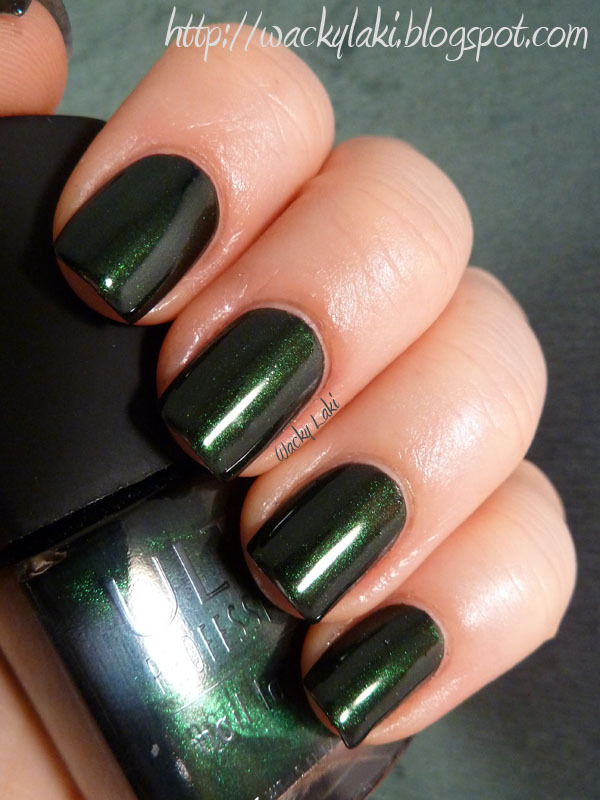 On it's own, Ulta's Green with Envy is a blacked forest green with a green shimmer. Application with this was okay, but not perfect. It took two coats for full coverage, but did have a tendency to leave bare spots, so it really needed a light touch to avoid dragging. Also, no matter how hard I tried, I could not get this polish to warp around my tips. I love the color, but the formula left something to be desired. I'd love to hear your thoughts on the color and the stamping. Do you have stamping rules you follow/break? 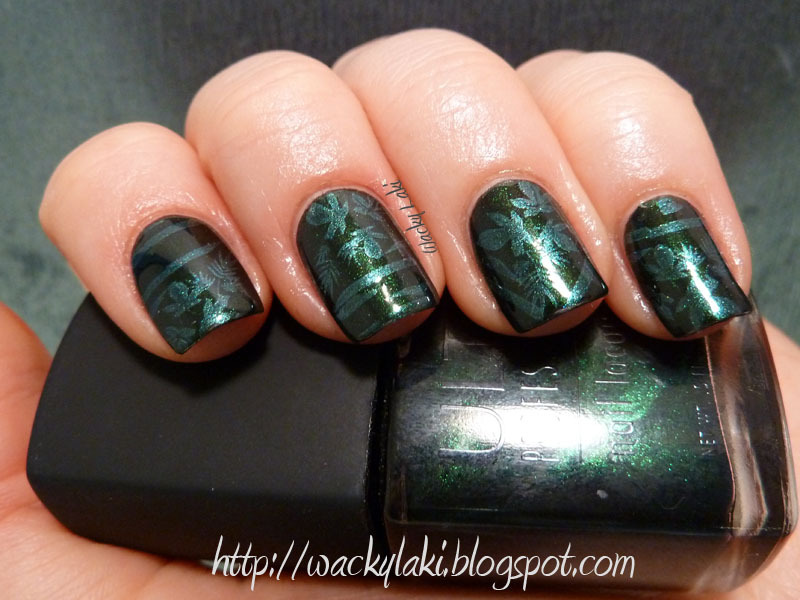 The subtle stamping is very nice! I adore this! Hey cool! I'm in that group as well! Just couldnt do this weeks challenge! This is awesome! I love greens! I didn't even recognize this image but it is sooo lovely! I'm really glad you all like it! I do like subtle stamping. There is just something about it that catches my eye.